This has taken a while, but then again we have been just a tad busy lol. I have wanted to share with you my Baby Shower details for a while and just now getting around to it. I hope you like it as it was such a surreal amazing day in so many ways. One way, was because she was our miracle pregnancy, as we had amazing luck with IVF, two was that she was supposed to be in my belly when the shower took place and I had just got released from hospital 2 weeks prior to this and she was here. SOOOO many emotions happened that day inside my heart. The most significant one was "blessed" as we have been beyond blessed in so many ways and thank God above for watching out for our daughter and keeping her with us. I will never forget the true miracle we saw happen in front of our very eyes with her. 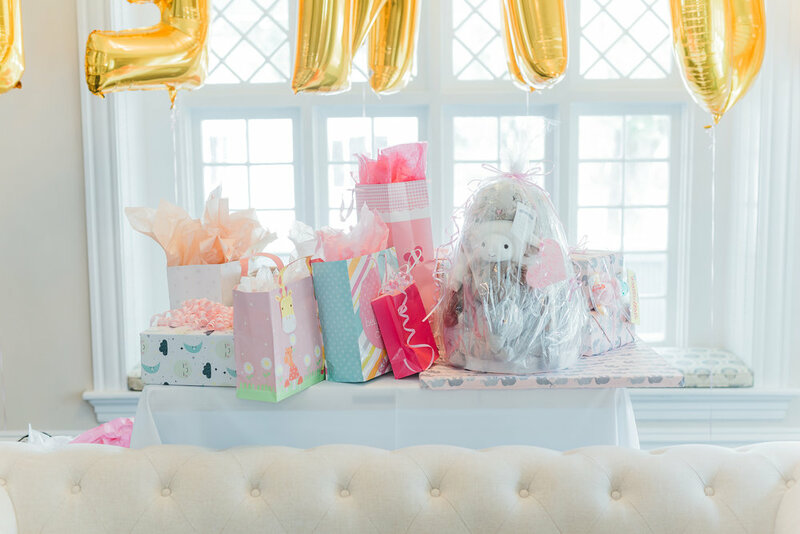 Now, here is my shower details and experience to celebrate our sweet little Lenny! When my Mom and Mother-in-law asked where I wanted my shower or what I had envisioned I said the place without skipping a beat! I said The Orlo, I want it at the Orlo. I knew this because I had done a photoshoot about a year prior there before they opened their doors to the public and it was STUNNING!! I remember being in "awe" of every tiny detail in that house. It was beautiful, stunning, charming, cozy, simple and yet elegant all in one. I went home and told Logan, if we are ever lucky enough to have a baby I want my shower there and the fact that it happened was so special because when you get told you can't have kids the "natural way" it's the little things that matter, like having your dream shower. My Mom and Mother-in-law called to see if they did showers and not just weddings as it is typically a wedding venue so we had to make sure and when we found out they did we booked it immediately. 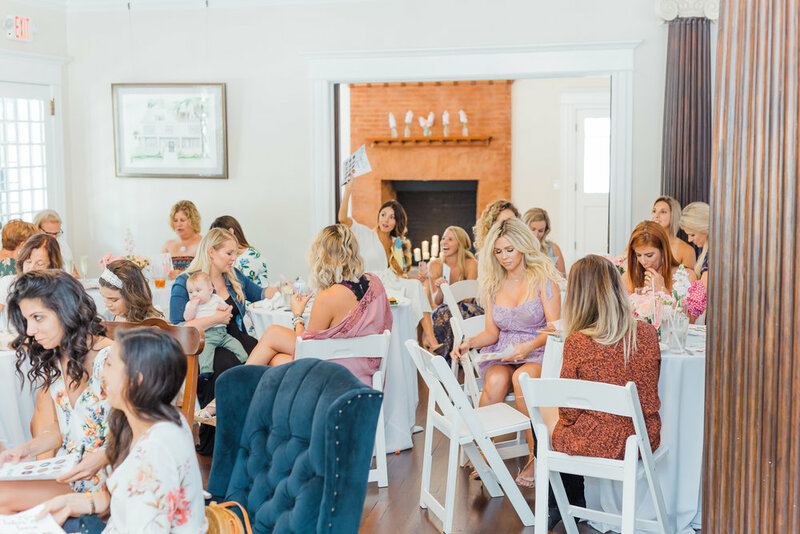 So yes, to all my Florida girls you can have baby showers, bridal showers, birthdays, events and weddings there as the space is huge and set up for any occasion! I didn't realize this so now that I know they offer it to all life events I am telling everyone! 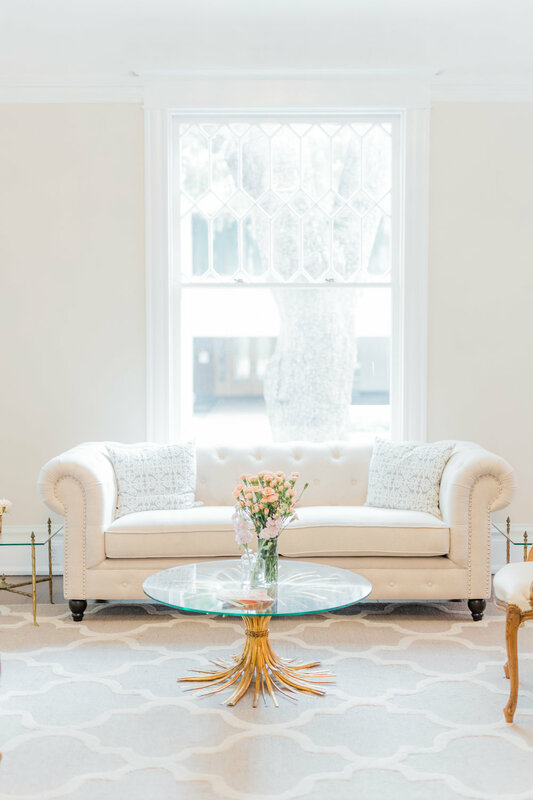 On top of it being a beautiful location, the staff was amazing and went above and beyond to help us with any and all questions and were so easy to work with. 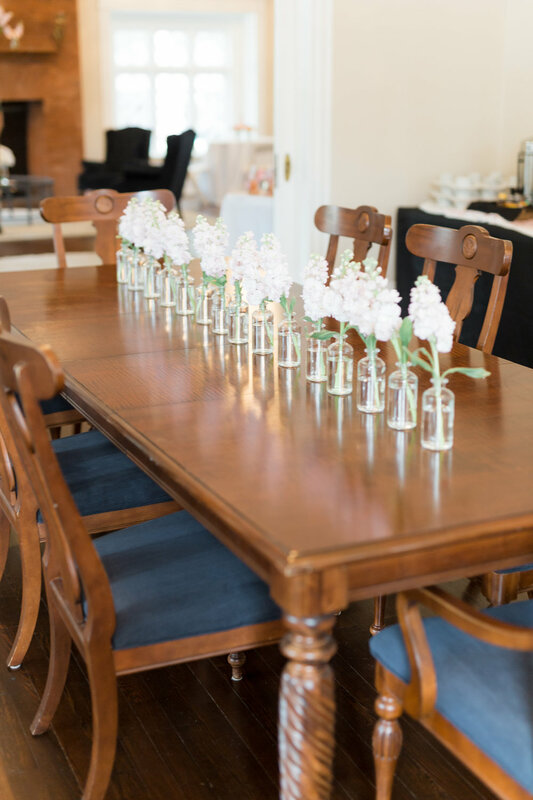 They let you bring in chairs, decor and you can choose a caterer they recommend or bring in your own which is great in case you want to use someone not on their preferred list. I remember when I got married at Bella Collina thinking, "I will never get treated this good again" and I was wrong. As special as Bella made me feel, so do the Orlo. For food, I just wanted simple tea sandwiches and some scones. Nothing too fancy just simple and good. We chose to go with a caterer outside of their preferred list to save some money and they were fantastic. They were called Affordable Catering. My mother-in-law found them through a friend of hers and they raved about them. 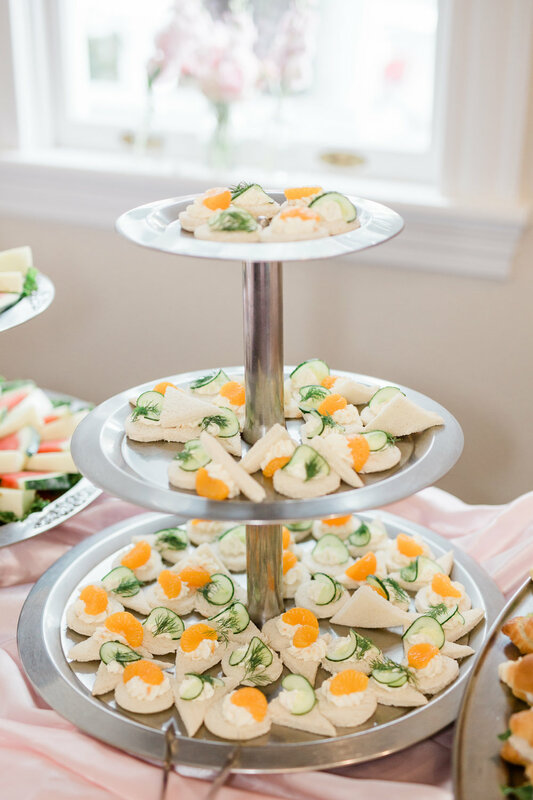 We had mini croissants, cucumber and dill sandwiches, orange and cream cheese sandwiches, mini muffins, strawberry scones, and fruit and cheese. Just enough to snack on without it being a full meal. I wanted people to mingle, enjoy good snacks that were simple and not messy lol. Affordable Catering, came and set up and also created a beverage station with tea, infused water, and Champagne all for a reasonable cost and were yummy! If you do choose a preferred vendor I would pick Salt Block, as they are Tampa's best catering company and dear friends. They were just very busy that weekend with weddings so it didn't work out but I highly recommend them! Whenever I go to showers I always love seeing tiny details the hosts makes for the beverage station. I know it's weird, but I love it! My sister-in-law Tally, came up with such a cute idea to put rock candy in the champagne for a pop of pink! I was in love, as it was so cute and creative and all I wanted was pink lol. SO that was such a fun little way to dress up the beverage station and make it colorful. As most of you know, or maybe you don't know this, but I love desserts. Everything! From cakes, cookies, cupcakes, doughnuts, cheesecakes, ice cream, fancy ones I can't pronounce, I love them all! However, when I have a party I want everyone to be happy and what better way than just the basics. Cake, Cookies and Cupcakes! So that is what we did! 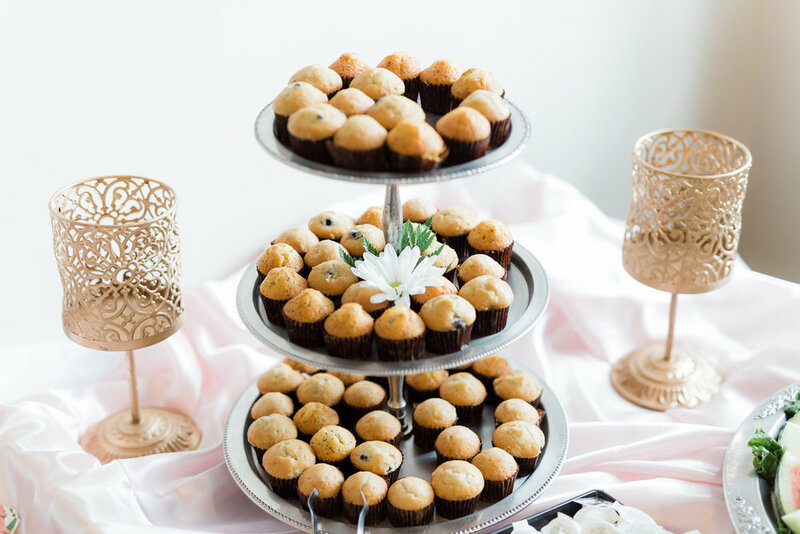 We found our Dessert company on Instagram through my photographer/friend Sara. She had done a shoot for her and I was in "awe" of the colors and how fun her desserts looked. The company is the Wandering Whisk, I know really cute name right? I told her my cousin Ashley the flavors I wanted as she had sooo many to pick from and I just wanted pink. Pink everything, from icing to the strawberries in the cookie sandwiches, just pink and fun, and that's what we got, I chose a naked cake because they are just so simple and classic on the outside, but since I got confetti cake on the inside it was a take on a child's bday party which is exactly what I wanted. I also chose cookie sandwiches. These are something I have loved since I was a kid, and I remember going to the mall with my mom and she would always take me by American Cookie Company (fav place ever) and would always get me something and I usually opted for a slice of cookie cake or a "double doozie" which is what they call a cookie sandwich. When I saw the Wandering Whisk had that as an option it was a easy choice and I got strawberry and then confetti sandwiches. For those of you that don't know what a cookie sandwich is, it's just two cookies with loads of icing in between... I know, simple and genius! I also got mini red velvet cupcakes as red velvet has been my favorite since a kid as well. Long before sprinkles cupcake made it trendy lol. They have been a southern staple in our house since I was born. I wanted all desserts to reflect my childhood memories and I can't wait to do the same thing for Lenny, so maybe one day when she has a wedding or shower she wants things to remember our time together when she was just a kid. So this is the best part... you don't need decor at The Orlo! It is already so beautiful and clean that you don't have to overdecorate to make it look good. Granted I wanted very simple and I am allergic to flowers so it was going to be simple for me, but you don't have to spend money decorating a lot is my point with this venue. All the tufted furniture is already there which makes it so easy. I wanted beautiful "fluffy long flowers" as I call them and I showed my mother-in-law a pic and she ordered them from Sam's Club. Yep you can order flowers from Sam's Club! And they are gorgeous and affordable! Again, I just wanted soft and pink, that is it. 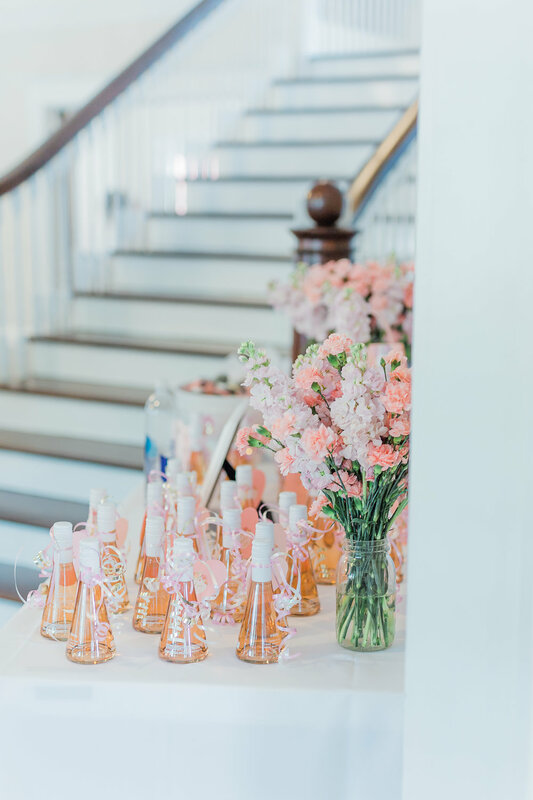 So because of my insanely bad allergies (ask my husband, he has to deal with me every week sneezing because I love flowers and will buy them and then I can't breathe) lol, we just used those and sit them around the venue for touches of soft pink. Simple, feminine and elegant. Standard Wine also has a red and chardonnay as well. If you are getting married or have an event I think these are great gifts to give out as they are timeless, classy and everyone wants their very own bottle and trust me they will be asking where you got them. The next item I gifted was the spiked pudding from Spoonable Spirits. I know, everyone was like "wait, there is alcohol in here"? I said yes, and yes I know its delicious! I found out about these through my friend Sydney Bass. I think she got them for Jessie's shower and I fell in love because not only were they tasty but they are fun and everyone will love spiked pudding as it takes them back to their college days! Again, I think these are super fun to have on a bachelorette party or to give to your bridesmaids! They are something that is not expected and will use! Well, that wraps up my Baby Shower details!!! 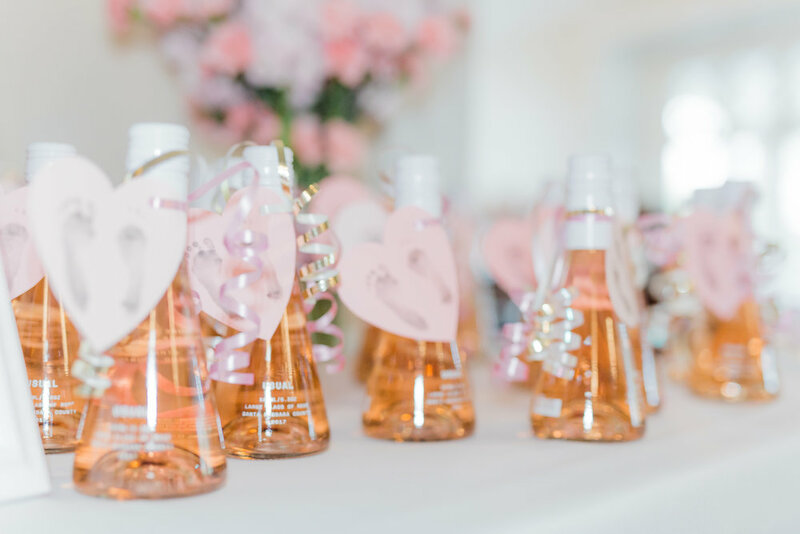 I hope you loved it as much as I did and I know my family worked really hard on it and it was everything I ever wanted for my all pink shower. Please comment below if you have any questions at all! I can't wait to share more posts with you as we have a lot of things coming up like the nursery, our remodel and more! Below are some more pics from my shower and my dress I got is from Love and Lemon.